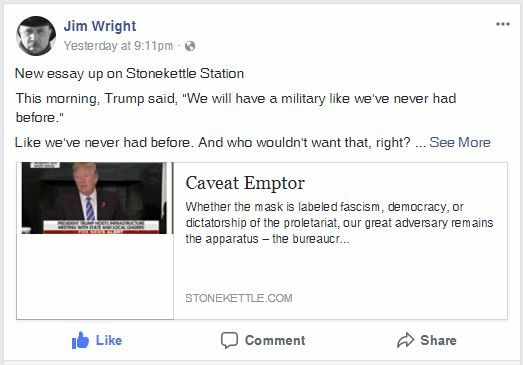 Jim Wright at Stonekettle Station was referencing the subject of the Orange Hate-Monkey‘s (OHM) military plans when he titled his piece Caveat Emptor. The OHM is selling us a military vision in his usual huckster fashion. The most glorious military you’ve ever seen. Anyone who believes this to be true is as dumb as the people wiring their account info to 419 scammers thinking they’re going to win big. Pretty much just as Jim tells the story. When I used the title Caveat Emptor, I was speaking to the selling of the OHM’s alter ego, Trump the businessman, Trump the deal-maker and fixer. Caveat Emptor, buyer beware. You are being sold a bill of goods. You are being taken. Guard your wallet. The OHM is none of those things. The OHM is a money launderer, serial philanderer, and a thief. Not necessarily in that order. When I get a quotable snippet from one of Jim’s articles, I tend to post it all over the place so as to do him a favor and drive traffic to his website. Since I can’t afford to pay him for what he writes, the least I can do is promote him where he isn’t already being promoted. I posted the above quote to Google’s idea of a social platform, Google+ as well as a few other places, but I only got replies on G+, and what I got in response came out of the anarchist/voluntaryist wings of the political spectrum, a commandment to vote harder. I recognized the flavor of this attack almost immediately. Voting is useless. Voting doesn’t fix anything. Ah, we’re dealing with a libertarian here. I have little to no patience with libertarians, having quit that cult not so long ago. I don’t participate in government (as the snippet demands) to achieve anything specific for me personally. My personal goals are not what voting achieves. This is a core problem with libertarianism specifically and individualism generally. Voting isn’t about me and it isn’t about you or anyone else specifically. This is true of most life experience, but try explaining this fact to a libertarian or anarchist. It’ll go right over their heads. But that isn’t to say that voting and government as a structure haven’t achieved measurable good. General goods have been achieved and the list is nearly endless. Longer even than the evils that government has created through its existence. It is always that way with the tools we create. The evil comes with the good. The elderly no longer have to die penniless and alone. The sick now have places to go to be cared for. The poor have the beginnings of structure that could end their poverty if used properly. Libertarians will say these goods were achieved by use of force because they don’t understand the nature of money, the meaning of money, etc.but they insist on force being applied to them before yielding so that they can say told you so. I know because I’ve seen this done many times over the years. That is the definition of a self-fulfilling prophecy. You libertarians and anarchists, you crazy right-wing armaphiles, you are not any deader when the cops shoot you for armed resistance than the dead black guy who just happens to be in the wrong place at the wrong time. What you are buying with your money is death, exactly like funding a military is buying death. The trick, just in case you are wondering, is to outlive the other guy, which means you are failing to understand what you are buying if you end up dead in the process. Caveat Emptor. There’s some good advice offered gratis. Don’t say I never gave you anything. I’m betting Trump will not be the nominee. I’m already seeing stuff happening behind the scenes that will make it possible to put someone else in as the nominee even if Trump is selected by the (certifiably insane) base of the GOP and Tea party. As I’ve commented more times than I care to remember, it is the anarchists (and libertarians) willingness to call all government tyranny that has brought us every dictator in history, from Napoleon through Stalin to whichever dictator that holds power today. If all government is tyranny then any attempt to govern that springs from anarchist roots will be tyrannical. This also explains Trump’s popularity with the Tea Party, who were once libertarians to a man. The LP is well rid of them. The Charlie Foxtrot continued unabated. Thus ends this demonstration of the bankruptcy of libertarian and anarchist thought. The John Birch Society finally rules supreme. Facebook comments backdated to the blog. This one is for Dylan Boswell, the shortest term facebook friend I’ve had so far. I find it interesting that someone promoting the Zero Aggression Principle would have need of a weapon designed to kill people. It takes professional grade tolerance for contradiction to not see the hypocrisy in those two positions held together. How can you not be the aggressor while killing someone? You can wave your hands in any flim-flam manner you wish, but no amount of hand waving will change the fact that you are alive and the other person is dead at your hand. That is aggression, plain and simple. It’s excusable in certain circumstances, but you don’t get to kill people (outside of war) just because you want to. So yes, owning a gun that carries the appearance of one designed to kill people signals the potential of aggression (openly carrying any weapon signals this to some extent) Ask the Somalis, the Afghanis, the Iraqis if they felt threatened when approached by people carrying those weapons. …and yes, you are stupid for owning a Pit Bull. That breed of dog was carefully bred for aggression against other dogs, a stronger bite and stronger physic. As a dog owner whose dogs have been attacked by free-wandering Pit Bulls, more than once, I have very little sympathy for the cries of how gentle Pit Bulls are. They were made into weapons, to fight in a sport that mercifully (soon will) no longer exist. I’m not certain that the breed has a reason to continue to exist. A bit of housecleaning here. Pit Bulls do not have stronger bites, nor are they physically stronger. They are more aggressive with other dogs and this is especially true if they have had training to be aggressive with other dogs; AKA, being trained to fight. The extent that any dog is aggressive is quite probably correlated to the history of that dogs lineage. In other words, if your dog is the direct descendant of dogs that were bred to guard and/or fight, you will have a dog that is aggressive with other dogs and sometimes people. Having a dog that you want to threaten others with is having a liability on the end of the leash you are holding. You should picture dollars flying out of your pocket. You don’t want a dog that bites. What you do want is a dog that follows instruction. A subtle but important difference. I have never been an anarchist. I find anarchists to be some of the most delusional (and generally harmless) people around. Humans have always adhered to some form of tribal authority, and work best in groups aligned on a common goal. An individual can survive, but it cannot thrive without the group and its greater than the sum of its parts compiled results. 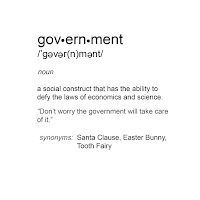 To suggest that we can simply do away with governments and tribal authority and replace it with nothing is to ignore reality; and the solutions offered by anarchists as a replacement don’t look any better to me than current government. When you pull that trigger on a trespasser, just remember, you are government doing violence on someone who has explicitly chosen to disregard your conceptualization of property and rights. You are applying force to someone who, specifically, has not agreed to be bound by your conceptualization of where your rights end and his begin. It is an application of your personal self-government on another person. As far as the tax argument goes; utilizing services paid for in advance through taxes, without paying taxes, is also theft. Fire, police, emergency services, roads, etc. all require investment in advance in order for them to be available when needed. The populations of the various nations have clearly stated their desire for these services to be provided; and to the extent that the actual costs of these services are accurately levied as taxes, those taxes are not theft but the actual cost of living in the society that you were born into or chose to migrate to. It’s called the social contract; and no, you aren’t required to sign it in order for it to be in force. Attempting to live in the society and not utilize the labor of others, not utilize the services paid for by others, is an exercise in futility. So many thousands of man-hours go into the computer systems that run the internet; are you certain that every person who contributed to this conversations ability to exist was voluntarily employed, fully compensated, and wants for nothing further that should be his right to ask? How then can you say that you owe nothing to society? That the bills government asks you to pay are completely unwarranted theft? A BBS comment of mine harvested from somewhere on the internet. Voting Irregularities, as in ‘Errors’ Transposing Votes and Diebold Machines Removed Votes From Obama and Paul a link sent to me by a fellow Ron Paul supporter, outlining outright vote counting misconduct, and touching on the already well understood failings of the Diebold voting machines. This is a major issue, unless of course you’re an Anarchist who just wants government to go away. Newspeak (the language of engsoc in 1984) is a language that is crafted in such a way as to make it impossible to think wrong thoughts, because the words will no longer exist to express them. Anarchists are engaged in crafting their own version of Newspeak these days, redefining words like Power and Government to meet specific goals. power and liberty are opposites; wherever the former appears, the latter disappears. Power is, in fact, the only way to secure liberty. Individual will, inalienable rights, individual’s power. Not recognizing power unless it’s power relegated to state authority is redefining what power is. 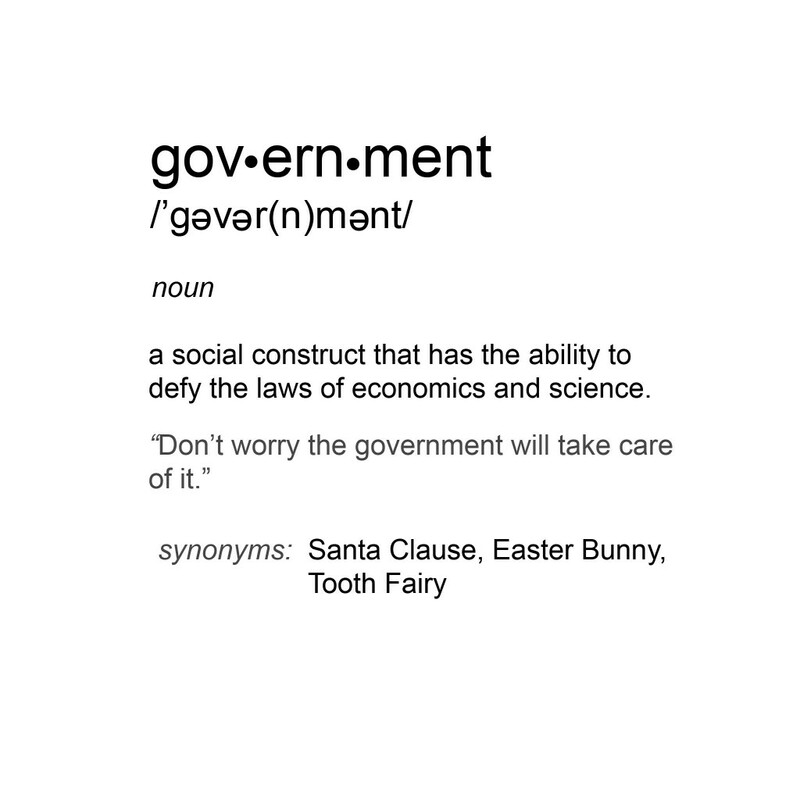 Government exists, and will always exist, because self-government is still government. Unless, of course, you are an anarchist; in which case, state and government are interchangeable concepts, and all government must be abolished (and yet somehow this won’t result in chaos, even though governing oneself would presumably also be a no-no) as the evil that it is. Libertarians engaging in a political campaign to have someone elected have from my point of view given up their claim on liberty; they are no longer striving for liberty as number one, but are working to give someone power to liberate them. More Newspeak. The elections will take place whether libertarians participate in them or not (what about the LP? They exist only to participate politically. I guess none of them are libertarian at all in this anarchist’s opinion) Taking part in politics is the only way to secure one’s liberty (politics, after all, being nothing more than the art and science of government) and any candidate with a proven track record like Ron Paul’s is going to be an improvement over any of the other candidates who might get the nomination. …which it will take by force, whether force is required or not. Given that, I’ll work to limit government in any way that I can personally, including supporting a candidate in a party that I do not claim as my own. It’s better than the alternative. Doing nothing.